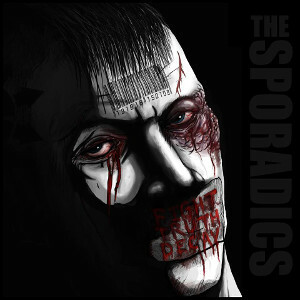 Laying their cards on the table with the opening track, ‘Festival # 23’, The Sporadics make sure you know they are most at home in a muddy field with a crate of cider, surrounded by mates, falling over fires and turning sleeping comrades into human Buckaroos. But this, their second album, is anything but crusty brew crew shouty nonsense. They knock out some of the finest ska-punk-dub you will find on any stage anywhere. The rhythm section produce dubtastic bass lines and driving, pounding drum beats. Layered over the top we have guitar that floats between sharp skanking chops and hard melodic riffs. If that were not enough, the vocals have a clarity few punk bands even attempt, let alone achieve. The lyrics tackle issues few bands could take on without resorting to sloganeering or just sounding pompous. No pomposity here though, as singer Shaun has a knack for taking a serious subject and turning it into poetry, but still managing to keep it danceable. The now sadly defunct independent news media outlet ‘Schnews’ gets a song named after it to make sure we do not forget it – as if we could. The famous strap line “If you’re not pissed off, you’re not paying attention”, says it all, but the point is slammed home with lines like: “The currency they pedal here, propaganda, lies and fear. It’s been the same from year to year, now here’s the latest news, question everything they do, turn your TV off today”. ‘VAT’ (Value Added Terror) talks of the big brother tactic of making you fear your neighbours, ‘Broken Britain’ references the dumping of working people on the scrap heap and ‘Conflict’ reminds us that the capitalist system thrives on war and – erm – conflict. ‘Itchy Dub’, as the name suggests, drops the pace a little and gets dubby. It talks of broken democracy and profit making from the services we rely on, but hints that the time of reckoning might not be far away. “You disregard and disrespect the people of this land, what goes around will surely come around, you try to take our dignity and kick us to the floor, then wonder why we burn your buildings down”. ‘Used to be a punk’, challenges the idea that you can be an ex-punk. With punk being an attitude, either you have got the attitude or you don’t. If you don’t, you were just a fashion victim who didn’t really get it anyway. ‘Debt Crisis’ is about what it says on the tin, whilst ‘National Lies’ talks of the scapegoating of Johnny foreigner that so often is used by the right during an economic downturn. “Our children don’t see colour, they just want to play with each other, hate is something learned, its time the tide was turned.” As the lyrics to ‘lies’ unfold we get some of the heaviest guitaring on the album mixing with some of the dubbiest moments, perhaps giving us the perfect introduction to the band for the uninitiated. We return to the subject of reclaiming our country with ‘Tear down the law’, just before slowing down slightly and suggesting the positivity of ‘Love’ and hope may be the answer in the long run. Winding up the album we have ‘Poem for the fallen’, a tribute to Crispin Baker, festival legend, who was taken from us earlier this year. It is basically a poem with minimal acoustic guitar and the sound of a crackling fire in the back ground. And then it’s gone. Twelve tracks is not enough, you want more. But then again, if this were a triple album, you would still want more. At least you have the beautiful packaging and lyric booklet treasure and return to time and again while we wait for the third album (you can have minutes of endless fun looking for the deliberate spelling mistake). Clearly the band have been influenced by a few notable big players on the ‘anarcho-ska-punk-dub’ scene, but it would be churlish to reference them here, cos these guys are no imitators. As Picasso once said, “good artists copy, great artists steal”, and these thieving bastards have stolen the crown jewels, melted them into something of their own and can stand proudly on stage next to the best of them.